^ Renner, S. S., Schaefer, H.; Kocyan, A. (2007). 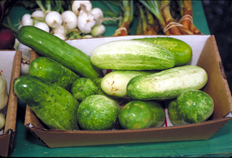 “Phylogenetics of Cucumis (Cucurbitaceae): Cucumber (C. sativus) belongs in an Asian/Australian clade far from melon (C. melo)”. BMC Evolutionary Biology 7: 58–69. doi:10.1186/1471-2148-7-58.